Then I woke up on Sunday and thought: WTF have I done? 180 bucks on a hammock? And will it fit? I checked the item description and, uh-oh, the stand is 15 feet long!! A quick measurement outside calmed my fears. The space I have for it is 15 feet, 3 inches long. Just made it. Whew. In rapid fashion, my hammock arrived today in two large boxes that I wrestled up to my second floor apartment. Assembly was a matter of clicking a few poles into place and in no time, I was laying in the sun, head and feet slightly elevated, with gentle breezes (and tree bud debris) blowing upon me. Heaven. I have decided that I am not going to work for the entire month of May, taking off on "sabbatical" to practice Hammock Therapy. It's been getting increasingly difficult to work and rather than try another protocol, or some other 'doing' treatment, I am going to stop, rest, and (hopefully) recover. OMG! I'm so happy for you that I actually have tears pouring down my face!!! That is so wonderful! Everything about that is wonderful! When it's chilling wrap yourself in a comforter! Being wrapped in a comforter on a hammock on a chilly day is heaven!!! I'm soooo happy for you! Awwwww Kim........you just made my day! Maybe my week! Maybe more! Kim! OMG! Yes! I'm so glad to hear about this. And so HAPPY FOR YOU! After I was struck by lightning in 1979, the ONLY thing that helped my nerves normalize and chill out was hanging in my hammock, which I did up to 5-6 hours per day. The rocking motion was so HEALING on my shattered body. It brought my at-rest pulse of 120 down to 80 in a matter of a few hours. And it helped me sleep so much better. It was that same summer that I began playing guitar--while lying down! Thanks for reminding me. I still have my hammock in my linen closet. It's time to get it out! I had to add this song--it just fits the mood so well! ENJOY! Oh Kim - this sounds just perfect for you. I'm so happy. True confession time - I'm a hammock addict. I have 3 - one for every situation. I have the one at home that is solid and goes on a stand - and can be moved in and out of the shade depending on what's worse - my temperature control or my heat intolerance. Then there's the big string matrimonial that comes out in the summer time and gets strung up. And finally, the fine thread cotton, beautiful blues & greens, light weight that I have fixed up as a kit to take anywhere - with straps that just wrap around trees/posts at almost any distance... and have S hooks that hold them in place. There's something about the slight rocking motion that I think reminds us of either being in a cradle - or even the amneotic sack - and induces deep rest. And I'm with Koan - if it gets cooler or windy - I put blankets bth under ando over me + nice warm socks and a hat. Glad you passed in action so quickly Kim, I hope your therapy proves fantastic!!! I had forgotten how blue the sky was. I didn't know how golden yellow the tops of the oak trees were. Oh, the swaying. The breeze. The birds. I'm in L.O.V.E. with my new hammock. I hung my hammock after lunch and took a half hour siesta swing in it. H-E-A-V-E-N! It slows your breathing down almost instantly. We need a hammock retreat center! Thanks again for reminding me how wonderful it is! I am so pleased to hear that you are getting such benefit from your hammock. The joy of the blue sky and the guitar. Please may I be excused hammock therapy - I can't stand them - even the slightest movement in them makes the world spin terribly so you can imagine what gentle rocking does to me lol. My husband and son love the hammock though. The funniest sight is when my husband leans a little too far out of the hammock and ends up being tipped out on the grass. Makes me laugh every time. I will stick to my lying in the shade in the garden therapy which I will do when the weather warms up enough to go out in the garden. There is nothing like fresh air and the smell of grass and plants. I agree hammock therapy is the best. I can watch the coconut palm leaves caress the sky and listen to the birds. My cats sometimes join me. I can watch my garden grow or give my guy hints on what to do there. 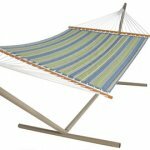 And the type of hammock in this picture costs only about $1.50 + less than another dollar for the hanging cord. Next time I'm swingin' there, I'll be thinking of you, Kim. Happy hammocking!!!! I used to live in a country farmhouse with two perfect pine trees and a hammock in between and oh how I loved to lie there and look up at the sun through the white pines. enjoy it totally!!!!! In 1996 when I had my first major relapse I was so pissed at being back down and unable to do anything and it was spring and in utter annoyance with my body I bought my first two lawn chairs and a popsicle mold. What an uplifting post...I can feel the swaying. Ah, yes. My first thought. also. I wonder if they make a recumbent piano? Now a recumbent piano is a really good idea. I would play one of those.